The Automatic Die Cutting Machine is a superb tool that is capable cutting through platen with pin point accuracy. 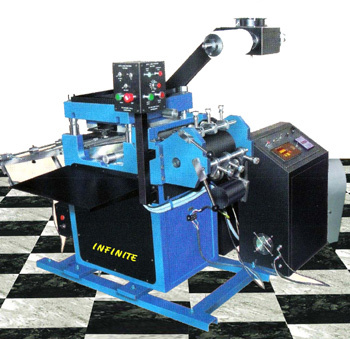 Moreover, the machine provides the advantage of having a computer control for the slices and the computer as well. In fact, the web speed can also be controlled by the computer. This helps to get the maximum output out of it. The machine is used for various purposes which includes die cutting paper self adhesive trademark, Dacron film trademark as well as laser anti-false trademark. All these facilities make the machine an appropriate set of soft printing machine, die-compress machine and even for relief printing machine. The Auto Die Cutting Machine serve a lot of commercial purposes as well. It is an integral part of the production of Hot stamping of the holograms and allied products as well. The commercial production of these particular products are usually done by using PET & Die Cutting Foils of varying thickness. Sheet Fed Automatic Die Cutting Machine Complete with Auto-Feed , Electronic Controls, adjustable depth of cut -Extremely Accurate Machine ideal for a Start-up Unit for Manufacturing Holograms. Semi Automatic and Automatic Roll Fed Models also available. This equipment is designed for the commercial production of Die cutting of the Holograms and allied Products, using Pet, Paper etc. Due to the highly automated nature of this latest equipment, the end-user can plan and control all the operating variables .The operator can control the web speed from a single control panel. This unique feature ensures that optimum results are obtained with minimum wastage.